Your tech can get out of hand if you aren’t careful. We admit that the tech gear we carry on our travels is in a never ending cycle of updating. I went back to look at a post we’d done three years ago about the tech stuff we carry on our travels and just shook my head. 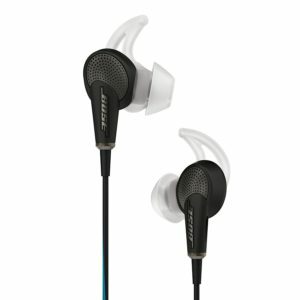 Of that list of several gadgets, we’re still carrying only one, the Bose noise cancelling headphones. And they’ve been updated by Bose, but we just haven’t bought the new versions ourselves. So, for late 2018, here’s what we’re currently lugging around. Actually lugging isn’t the right word, because we’ve used newer technology to pare down what we’re carrying, and with it the weight. So, modernize with us, and save yourself at least a little weight. When you put on as many miles as we do, it’s worth it. So, here are our favorite tech travel accessories. First on all tech lists, of course, is your smart phone. We’re both carrying the iPhone 7. I have the 7+ and Kris has the plain old 7. We’ll undoubtedly update them sometime in the future, but for now, they’re paid for, and that’s a big advantage. The cameras, especially in the 7+, are still outstanding. Google Maps. It works almost everywhere. Google Translate works with every language we’ve run into. I use the Booking.com and Hotels.com apps for booking hotels on the road. Tripit Pro is simply the best app for keeping track of all our travel reservations. Hotels, planes, trains, you name it. And it’s an invaluable aid for helping you rebook if a flight is delayed or cancelled. Well worth the $40 per year fee. There’s also a free version that has fewer features. I read the newspapers, New York Times, Washington Post, and The Guardian, every day. I also subscribe to Bloomberg Business and The New Yorker. None of those are essential for travel, but I’m kind of a news junkie. The various social media addictions, Twitter, Facebook, and Instagram, are also satisfied by the phone. And of course, there’s my music library, a flashlight and an alarm clock. One more thing, if you travel outside the United States (and are based in the US,) T-Mobile is the carrier for you. It works seamlessly in more than 120 countries. I just took my phone out to the remote bush of Malawi–and it doesn’t get much more remote than that–and it worked there for phone and 3G internet. I was amazed. 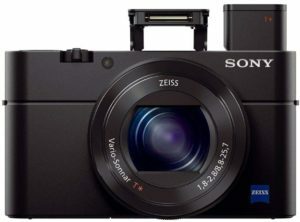 We both love our Sony RX100 cameras. I have a separate post on my camera equipment, but I’m going to make note of two smaller travel cameras here–cameras that fit the light weight and easy-to-carry mantra, yet still deliver outstanding results. I carry the Sony RX-100-III, and Kris has the RX-100-V. They are essentially the same camera, but the V model shoots 4K video, which we don’t use much. We should have saved the money. 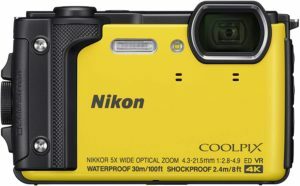 The waterproof Nikon Coolpix has been a workhorse when we’re around water. The other camera that Kris carries and really likes is the Nikon W300 Waterproof Underwater Digital Camera. It doesn’t shoot RAW, which is a bit of a drawback, but it’s waterproof to 30 meters (100 feet.) When you’re paddle boarding, kayaking, or snorkeling, that’s a must. And, you don’t need a bulky waterproof housing. This is the elegant solution to charging on the road. We used to use separate plug adapter, a power strip, and have to carry all the charger blocks for our phones, Kindles, Fitbit, etc. Now we’ve switched to this all-in-one plug adapter which has included USB ports. That means no power strip and no charger blocks. Needless to say, a big improvement. We’re both converts from the iPad to the Amazon Kindle when it comes to reading on the road. There are several reasons for this, but the main one is the Kindle Paperwhite displays black type on a white glare-free background. Like a book. It’s much easier on the eyes than reading on an iPad. Also, the battery lasts much longer. The new ones are waterproof. And finally, it’s lighter. We simply couldn’t do without the Bose noise cancelling earbuds. As I mentioned above, we both love our Bose QuietComfort 20 Acoustic Noise Cancelling Headphones. They aren’t cheap, but they’re the best at both sound reproduction and noise cancelling. And when you’re on a plane for about 24 hours, like I was last week, that noise cancelling is essential. And, while we’re speaking of hearing, I’ve added Eargasm High Fidelity Earplugs to my kit in the last year, and they can be life–or hearing–savers when you’re in a loud environment. They reduce the sound pressure and background noise, but still allow you to hear the person talking next to you. I love them, and never go out of the house to a restaurant or bar without them, even when we’re home in the Twin Cities. That charging & plug adapter looks much better than what I’ve been using. Thanks for showing it. Yeah, I’ve been using it for a couple of months. Saves carrying about five charging blocks, a plug strip, and a dedicated USB multiport. 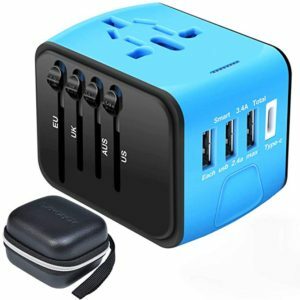 Will that adapter work in South Africa? I used it at a hotel in Johannesburg. As I recall, the South Africa outlet was the same as the UK. I do think they also have some other different configurations though, so this might not work. I had to laugh when I saw the charging station………reminds me of when we travel and have to charge all of our gear. 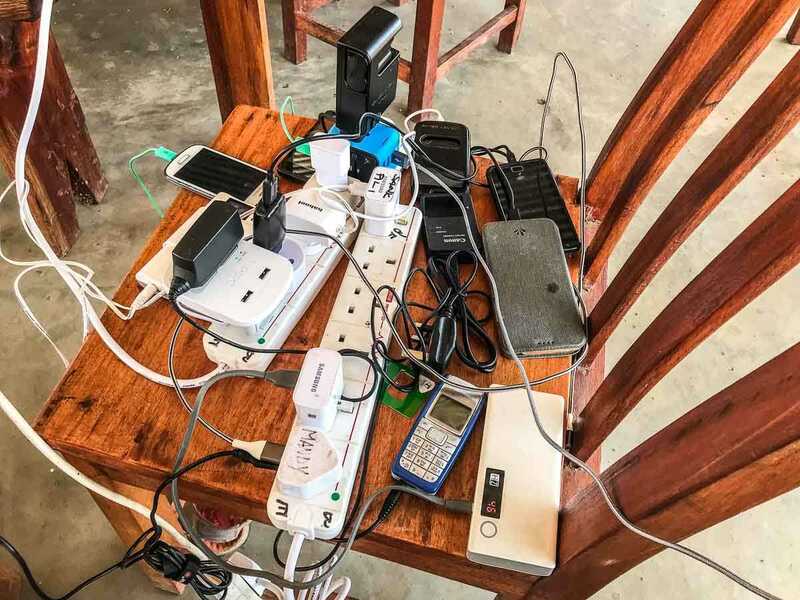 That was the charging station at our camp in Malawi in October. About seven countries and as many plug types represented. That charging block looks fab. I didn’t know they made USB ones that had the multiple plugs for all the countries. Looks like a great find. Thanks! Yeah, don’t leave home without it. In fact, I’m using it in Chicago right now.